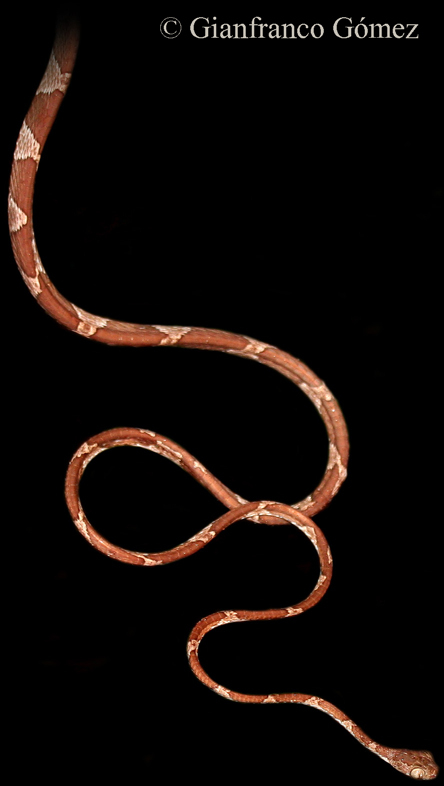 the Common Bluntheaded Snake, Imantodes cenchoa. These common nocturnal snakes are unlikely to be confused with any other snake in the area besides their close relatives: the rarely seen Banded Bluntheaded Snake (Imantodes gemnistratus) and the equally rare Speckled Bluntheaded Snake (Imantodes inornatus). Their slender, streamlined body sets these snakes apart from most other snakes and is crucial in capturing their favorite meals: sleeping lizards. In Costa Rica, most lizards are diurnal and usually sleep through the night. Due to the countless threats faced by these creatures once darkness shrouds the forest, lizards have developed an ingenious survival strategy. When choosing a perch to pass the night, most lizards wisely seek out the mid-line of a leaf or a very delicate branch or vine. This way, if they feel the movement of something moving up the plant to eat them sometime during the night, they can simply drop to the ground and make a quick escape from danger. Generally, this is a really good strategy, but the Bluntheaded Snake’s highly specialized skeletal structure helps them surpass it. eyes which it can actually cast downward, providing Bluntheaded Snakes an effortless, inconspicuous view from above. All things considered, the poor lizards have little chance against such a formidable predator. The moral of the story: in the rainforest every good strategy has an even better counter-strategy. they have secured their prey, their venom will immobilize it before they begin feeding. They can take prey up to ten times the size of their very narrow neck and adult snakes can easily feed on juvenile Green Iguanas and Basilisks. Despite being mildly venomous, Bluntheaded Snakes are docile and gentle creatures. They do not bite as a defensive reaction and are easily handled. An encounter with a Bluntheaded Snake is always very special indeed. It gives our guests on the Night Tour the chance to handle these magnificent creatures, dispelling the ingrained fear of snakes held by many and replacing it with admiration and respect for a creature that has evolved to dominate its niche. 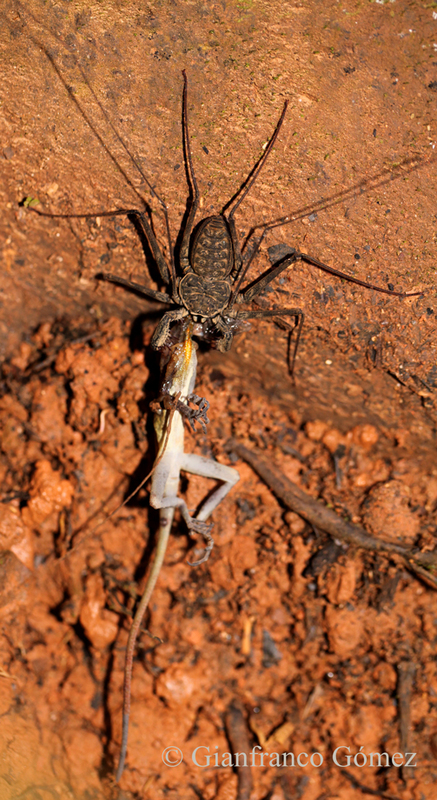 In his critically acclaimed series and accompanying book Life in the Undergrowth, Sir David Attenborough describes the tailless whip-scorpion as “horrifying”. Upon seeing a tailless whip-scorpion for the first time, our guests on The Night Tour undoubtedly share this sentiment – at least initially. Usually we find these creatures, more correctly known as Amblypygids, lurking motionless on earthen embankments or the trunks of trees. The collective reaction of our guests, more often than not, is a synchronized back-step, several gasps, and a range of facial contortions which all convey the same one emotion – FEAR. Now, this brings me to clarify a certain, very important point. Looks can be deceptive. 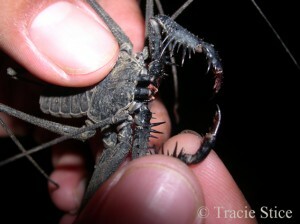 First, I should say, tailless whip-scorpions are neither scorpions nor are they spiders. As mentioned, they are arachnids, with eight legs, but they belong to their own distinct order called the Amblypygi. Unlike spiders and scorpions, which are just distant relatives, amblypygids have no venom glands. They are, as far as humans are concerned, completely harmless. I like to think of them as the “kittens” of the arachnid world. With a gentle touch, one can easily handle these creatures. When we encounter Amblypygids on the tour, I like to offer our guests the opportunity to hold them. Perched on an open hand, albeit a sweaty with anxiety-hand, the whip-scorpion will make no attempt to retaliate. It will typically sit quietly as the recipient proudly stands in admiration – both for the creature, as well as their own achievement. For those inclined to hold the tailless whip-scorpion it is, in some way, a chance to break through a psychological glass ceiling, and replace fear with respect for these unique creatures. Over millions of years of fine-tuning, amblypygids have achieved the anatomy of a superb hunter, as well as that of the ultimate escape artist. Their body’s are flat, enabling them to wedge under bark or holes and crevices in the earth. During the day, they occupy these hidden spaces, their dark exoskeletons blending perfectly in the shadowy depths. At night the tailless whip-scorpions will emerge, positioning themselves to ambush passing prey. 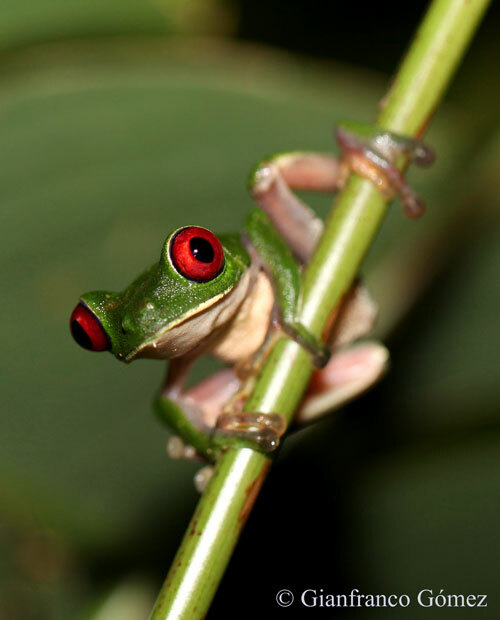 To detect their prey – an insect or small frog, they will rely not on the capabilities of their eight eyes, for their vision is poor, but rather a pair of specially modified legs. The first of the four pair of legs are long, fine, whip-like structures that resemble antennae or tentacles. 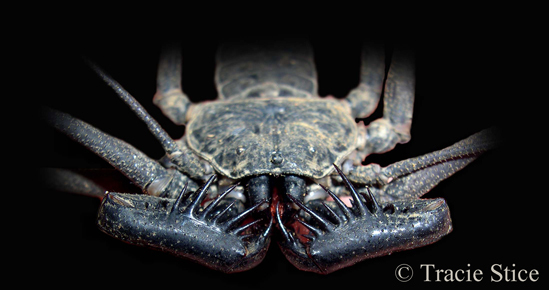 For the whip-scorpion, these legs function in many ways like a blind-man’s cane. They will tap-tap-tap to discover any insect that scurries near. They are capable of rotating the legs in almost any direction, as well as reaching into holes and crevices. Remarkably they can extend these legs in opposite directions and are thus able to analyze their surroundings to the rear or off ahead at the same time. A variety of sense organs on the legs detect the chemical clues of nearby creatures, as well as the vibrations their movements create. When an insect is detected they will strike quickly. To capture their prey, they will employ two, spine-laden palps, which extend from the sides of the mouth. It is the palps which inspired one biologist to describe whip-scorpions as “the living incarnation of the iron maiden”. While perhaps dramatic, this description is telling, for these creatures do capture and keep their struggling prey in a tortuous grip with their ferocious-looking palps. Death is often slow. Because Amblypygids have no venom prey must be eaten alive. a low, but excited tone, “Ohhhh, Maaaaaan!” He was walking several paces ahead and my immediate thought was “fer-de-lance”. I was sure he just had a close encounter with one of Costa Rica’s deadliest snakes. I called out for a confirmation of my suspicion. His reply was shocking, “I’ve just spotted a whip-scorpion eating an anole!” I quickly hustled up the trail as Gian rushed to set up his camera gear. 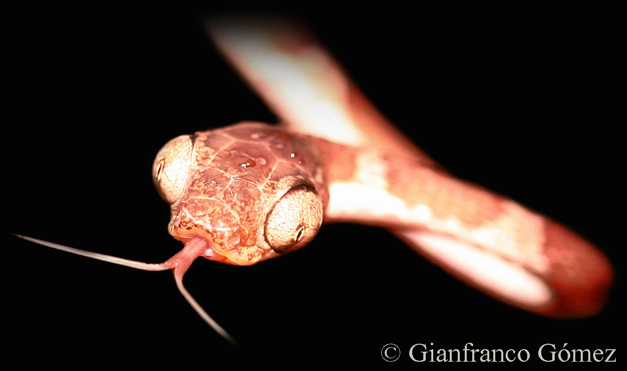 As Gian clicked off several shots my thoughts wrestled back and forth –as happens whenever I see any creature being eaten – from sympathy for the helpless lizard to the realization that the whip-scorpion has to hunt to survive – and survive it has – for millions of years. 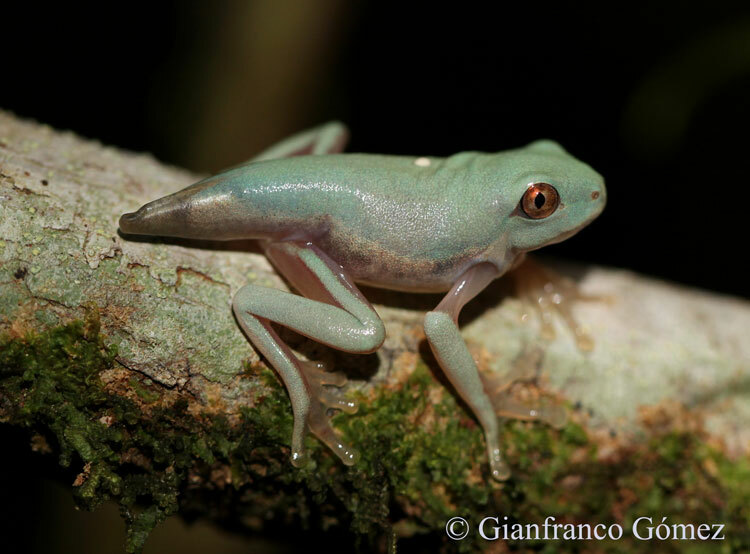 The Gaudy Leaf Frog, Agalychnis callidryas, has come to be one of the best known ambassadors for Costa Rica. Along with toucans, monkeys and quetzals, Gaudy Leaf Frogs have come to embody all the enchantment and beauty awaiting discovery in the tropical rainforest. In Drake Bay, we are lucky enough to have these lovely creatures as a mainstay on The Night Tour. Their charm and style never fail to marvel guests and guides alike, and usually make for one of our most popular encounters. 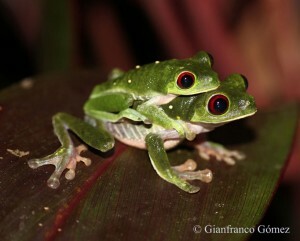 Gaudy Leaf Frogs are more active during the rainy season, when they breed, and are much easier to find. Males tend to call from their perches in the hope of attracting a gravid female with which to mate. An anxious female may sit for hours listening to these calling males before choosing the one she is attracted to. At this point she will walk towards her chosen mate pretty much in a straight line. Once they meet, they will embrace in axillary ampexus and begin the mating process. The female frog begins her search for a suitable leaf on which to lay her eggs. She may lay between 10 and 100 eggs in a single egg clutch; and may lay up to 5 egg clutches in one night for a maximum total of 265 eggs. The eggs are transparent. As such, the developing tadpoles can be observed wiggling around, as they grow larger and larger during the course of a week. mass, which has provided them with nourishment and protection. Once they are free of the egg mass, the tadpoles fall to the ground and are swept away by the torrent of heavy rain. Hopefully they will end up in a puddle, where they will finish their development and eventually transform into tiny little frogs. 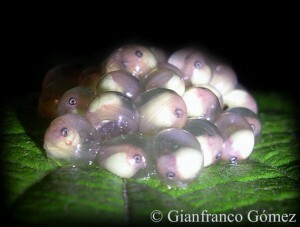 home, in an aquarium, from their eggs stage until they emerged from the water. With a steady diet of flake fish food they completed their metamorphosis in about a month with minimal casualties. In nature this process may take as long as 80 days and the survival rate is low. The photograph above was taken the day this lovely little Gaudy Leaf Frog left the water, as it was being released back into the wild.